I completely agree but trying not to get any hopes up. We can't get distracted by whatever TPTB decide on, in their "wisdom." True! An amazing performance is an amazing performance, no matter when it is performed. Joshua has been dealt a bad hand all season performance-spot-wise yet he's still here, why should a bad slot tonight stop him? Joshua's preshow message to the #DavisNation! Happy Show Day from our family to yours. Thank you all so much. This has been an incredible ride and we owe it to you. We're so grateful for your support. Looking forward to playing some original music on the show tonight! See you soon! I have just heard the sample for "Diamonds on the soles..." And I couldn't be more thrilled! First of all of course they sound great together! Then joshua hits a falsetto that is a surprise and gorgeous. Then it has a cool African sound to it! Then it's just plain fun and uplifting! The ones that count for votes are the other two which are equally incredible, but I'm still excited about this duet! Good Luck to Joshua tonight!!!! So happy he made it to the end!!!!!!!!!!!!! All songs in the Top 100! yes please top,ten working man's hymn, halllelujah, diamonds on the souls of her shoes! And also e music video for,working man is so incredible! I love the simple real charm of it! Love that his original received lots of positive praise in social media! he was AMAZING TONIGHT!!!!! I LOVED his version of Hallelujah!!!!! keep VOTING! Yeah! I thought my gosh he made this finale something special! #WorkingMansHymn #Hallelujah vote please and get his songs and get your friends to get his songs! Joshua, along with Sawyer, got all of his songs in the Top 50! Hope this reflects on the other voting methods! Top 10 is in sight! At 12 and 16! Hoping to enter top 10! 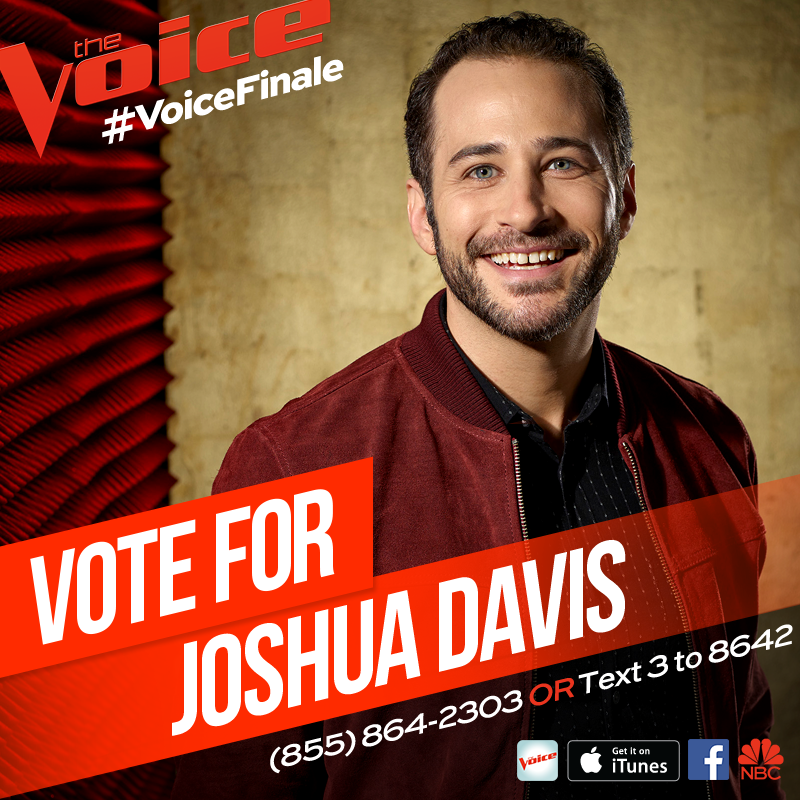 Let's keep voting #DavisNation! So proud to share these songs with you. "The Workingman's Hymn" is a song of mine about having hope in troubled times. "Hallelujah" is a Leonard Cohen song that is absolutely gorgeous. Please consider buying them from iTunes, voting and sharing! He's doing great, Hope to see a lot more movement in these songs in the next few hours! Hallelujah slipped because Meghan's new cover overtook him. Gotta get to Twitter and help sales along.